The Walking Dead has returned for season 9B this week, giving fans a better look at what the horrific new villains, The Whisperers, are all about. Not only have we've gotten the first brushstrokes of who The Whisperers are, we also got a first look at the group's leader, "Alpha," who will be played by actress Samantha Morton (Minority Report). 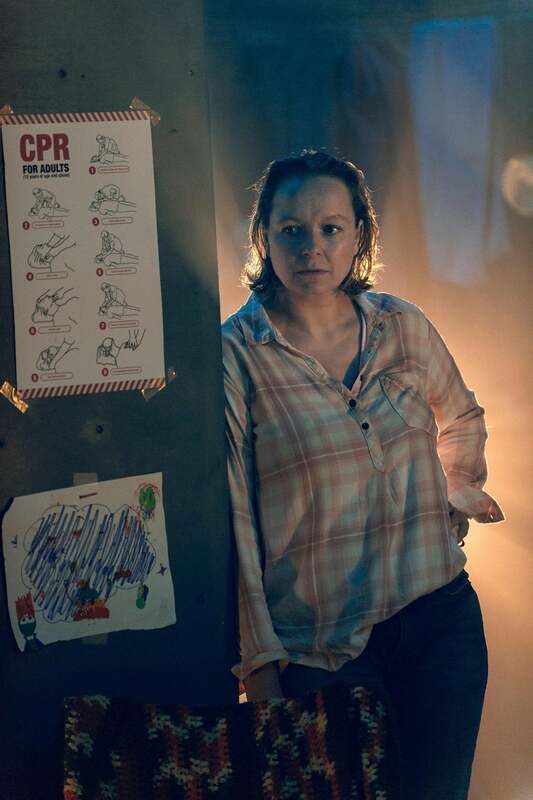 Now, thanks to an exclusive new photo from EW, we're also getting a first look at what Morton's Alpha looks like under her Zombie-skin mask. Check that out, below! This photo and the rest of the gallery featuring Morton (which you can view HERE) are clearly from a flashback sequence that will be included as part of The Walking Dead's next episode, "Omega". The episode will be used for provide backstory and context for how The Whisperers came to be, and what drives their leader Alpha to create the almost cult-like mantra that the group follows. From what we see in the photos, Alpha was once a compassionate and loving member of some kind of community, which was providing some kind of relief or aid in the midst of the crisis. We also see Alpha with her young daughter Lydia (Scarlett Blum), who was the Whisperers member that Michonne and Daryl captured, and are now holding captive at The Hilltop. Lydia's monologue in the most recent episode of The Walking Dead hints that her mom "Alpha" once tried the group community/aid approach to dealing with the zompocalypse, only to have it go horribly sideways. Whatever this community is that Alpha once belonged to, it clearly fell at some point, and the loss broke something in the woman who is now Alpha, giving her the skewed perspective that the only company the living should be keeping is with the dead. Warning: Walking Dead comic book SPOILERS follow! In the comics, very little is given about Alpha's past - only that she and Lydia had joined a group of survivors that eventually became The Whisperers. In her dialogue she indicates hat she's had to fight for the mantle of leadership before, but we don't get nearly the sort of dramatic insight that The Walking Dead TV series seems to be going for. At this point, it's no surprise that the Walking Dead show is taking a divergent path from the comics - so it will be interesting to see just how different this version of 'The Whisperer War' is, now that characters like Rick and Carl aren't a part of it, and Alpha will be getting a much bigger part of the story. The Walking Dead season 9B is now airing on Sunday night. Fear the Walking Dead will return for season 5 in 2019. Watch ComicBook.com's After The Dead each Sunday night following new episodes.